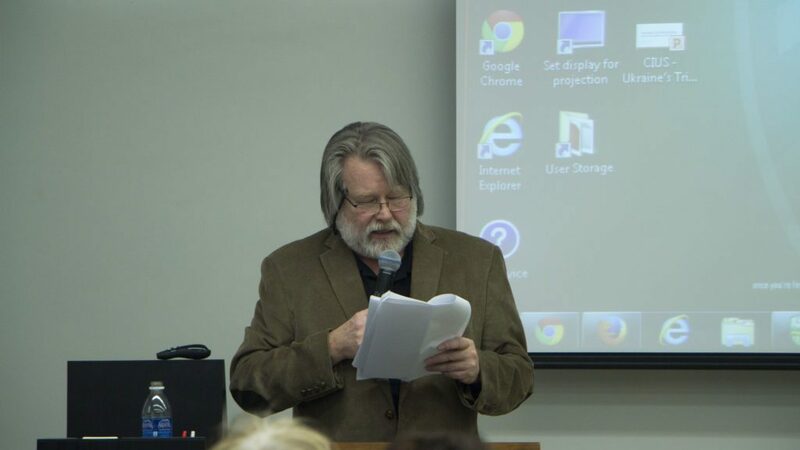 The symposium was opened by Dr. Bohdan Harasymiw, acting coordinator of the CPRS. 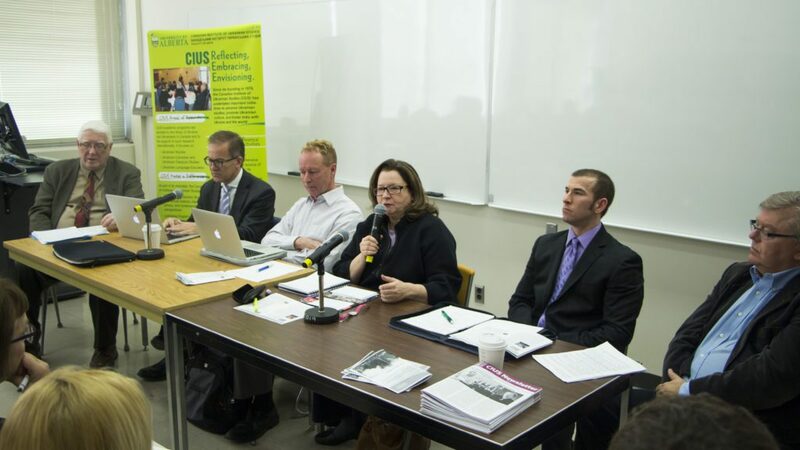 The first panel was devoted to the images, symbols, and identity of the Euromaidan Revolution. In her presentation, “Media Representations and Their Impact,” Marta Dyczok (Western University, London, Ontario) spoke about competing narratives in media representations of the events in Ukraine. She argued that information was used as a weapon, and thus the conditions of reporting have worked against the goal of providing accurate coverage. As a result, owing in part to the lack of expertise on Ukraine among Western journalists, international public opinion remains divided over the causes and consequences of events, the character of the Maidan protests, Putin’s sending Russian troops into Crimea, and the nature of the military conflict in eastern areas of Ukraine. 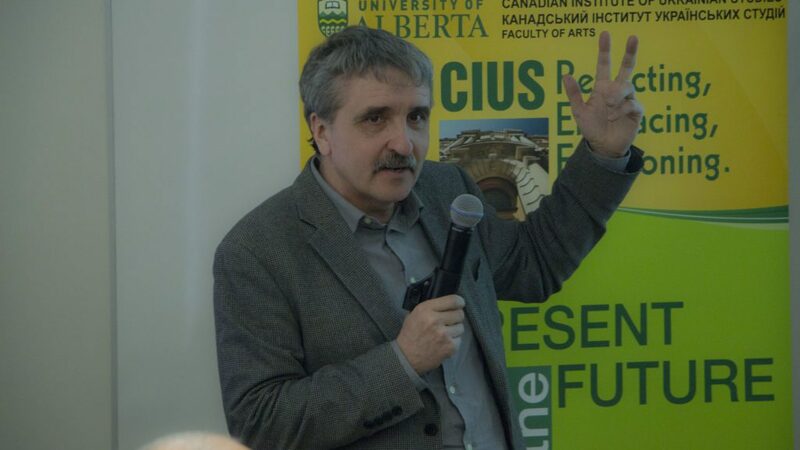 Speaking about the “Influence of the Maidan and the War on National Identity,” Volodymyr Kulyk (Institute of Political and Ethnic Studies, Kyiv) noted a dramatic change in Ukrainian national identity attributable to the Euromaidan protests, democratic transformations, the current war in the Donbas, and Russian aggression. Based on a nationwide representative survey and focus group discussions, his research has produced important data showing increased self-identification with Ukraine, greater pride in belonging to the Ukrainian nation, stronger attachment to symbols of nationhood and statehood (flag, anthem, and titular language), greater consolidation of the Ukrainian nation, enhanced solidarity with other members of the nation, increased readiness to defend and work for Ukraine, and increased confidence in the people’s power to change Ukraine for the better and make it a truly European country. In his presentation, “Russia versus Ukraine: Conflicting Historical Memory as Part of the Military-Political Conflict,” Vladyslav Hrynevych (Institute of Political and Ethnic Studies, Kyiv) looked into the conflict of competing historical memories as a significant factor in fostering antagonistic relationships between Russia, as an imperial centre, and other post-Soviet republics, whose “new future requires a new past.” The speaker pointed out that deep transformations have been taking place in the Russian Federation’s memory politics, which emphasize militarism, imperialism, anti-Westernism, and opposition to democracy and individual rights in favour of the imperatives of the collective. These principles run counter to Ukraine’s aspirations, based on Europe’s declared values of the rule of law, social justice, and personal freedom. On the second day, a round table on “Maidan 2004 versus Euromaidan 2014: Assessing Influence and Continuity” was held with the participation of David Marples (Department of History & Classics, U of A), Robert Murray (Frontier Centre for Public Policy, U of A), Larissa Blavatska (retired diplomat, Department of Foreign Affairs and International Trade), Lubomyr Markevych (project manager for the European Commission, formerly for the United Nations Office of Project Services), and Michael Bociurkiw (OSCE Special Monitoring Mission to Ukraine). In his presentation, David Marples compared and contrasted the Orange Revolution with the Euromaidan Revolution. Robert Murray focused on the international impact of the Euromaidan Revolution and the special war that Russia has been waging against Ukraine, concluding that the response of the West, particularly that of the United States, has been weak. Larissa Blavatska was stationed at Canada’s Embassy in Ukraine from 2009 to 2011. Her presentation focused on the failures of Ukraine’s Orange leadership, particularly of Viktor Yushchenko, which allowed Yanukovych to come to power. 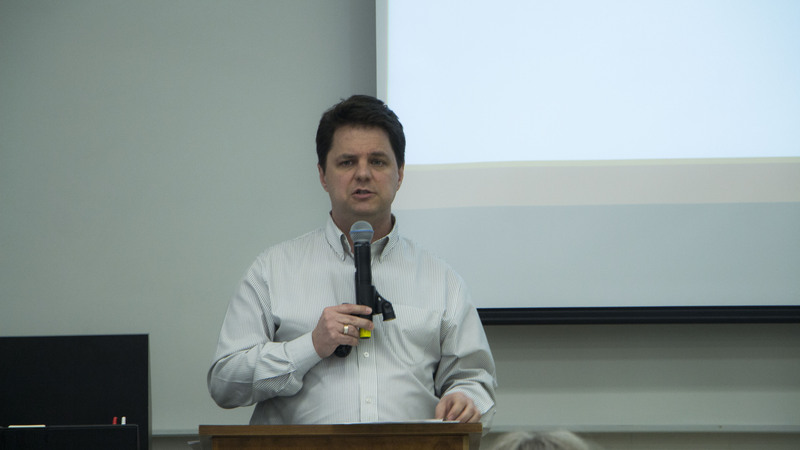 Lubomyr Markevych, who recently returned from Ukraine after living there since the mid-1990s, focused his talk on the role of students and churches and the transition of Maidan self-defence units to combatants now fighting in eastern Ukraine. Michael Bociurkiw has worked as a journalist in North America and Asia, and is today a spokesperson for the OSCE Special Monitoring Mission in Ukraine. He spoke on the mandate of the OSCE in eastern Ukraine, where unfettered, safe access is needed for effective monitoring of the situation. He also emphasized the humanitarian disaster and dire situation of the civilian population in the Donbas region as a result of the war, especially in regions under the control of the DPR and LPR. On the final day, the focus was on interpretations or reinterpretations of the Euromaidan Revolution. 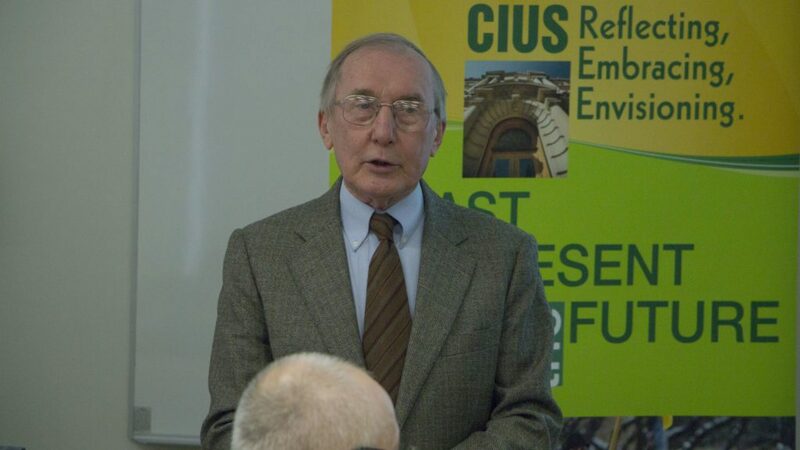 Speaking about “Maidan: Origins, Meaning and Other Questions,” Bohdan Kordan (St. Thomas More College, University of Saskatchewan) explored the origins, meaning and significance of the Euromaidan, highlighting the deep-seated changes in political and social consciousness that have occurred across the broad spectrum of Ukrainian society. Building on the notion that the Maidan is an expression of civic engagement (in the tradition of the 1989 civic movements in Eastern Europe), which places the individual at the heart of the new political project in Ukraine, Kordan examined and assessed the meaning and role of the Maidan with respect to the current conflict and the challenges that lie ahead. Taras Kuzio (CIUS), speaking from the United Kingdom via Skype connection, addressed the issue of “Violence, Criminality and Russian and Eurasian Nationalism,” a topic overlooked by many experts. He pointed to these as factors in sustaining Yanukovych’s criminal regime. Kuzio argued that Yanukovych and his Party of Regions have represented, by far, the most aggressive, anti-democratic, and corrupt political force in Ukraine, whose team stole about $100 billion during Yanukovych’s presidency. In his opinion, not Ukrainian nationalism but neo-Soviet and Russian nationalism has been and remains the biggest threat to Ukraine’s democratic system and to European integration. Mychailo Wynnyckyj (Kyiv-Mohyla Academy National University) considered the Euromaidan Revolution in Ukraine as a “great” revolution, comparable in effect to the American, French, and Russian revolutions. Unraveling the complexity of Ukraine’s Maidan, the speaker characterized the Euromaidan events as a triple revolution— national, bourgeois, and postmodern— in which a moment of historical completion (correction), a moment of political birth (transition), and an idealist nascense of novel senses (dignity, natural justice, organic solidarity) were reflected. 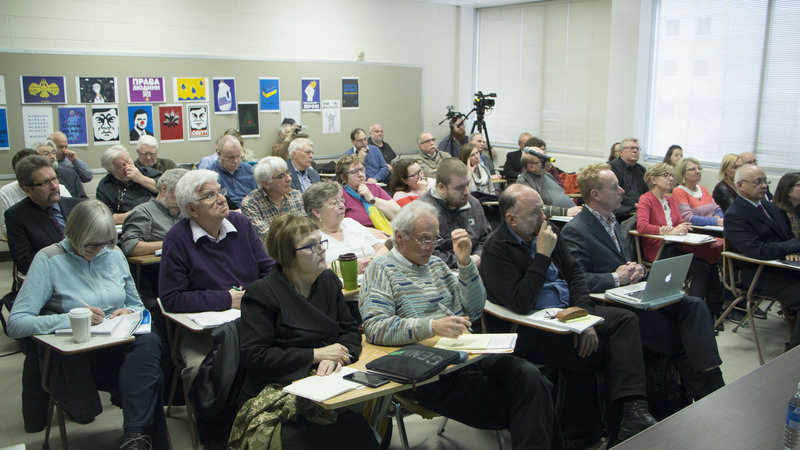 The symposium was well attended, and lively discussions were held at all three sessions. 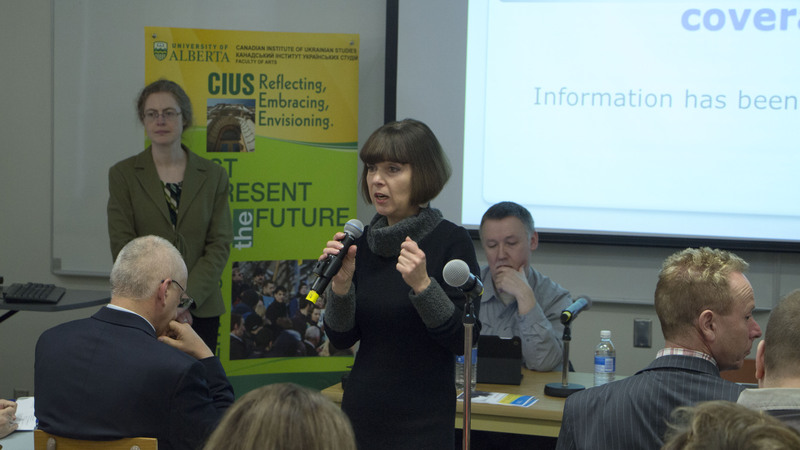 One of the highlights was the Shevchenko Lecture, delivered by the world-renowned Ukrainian writer Andrey Kurkov, who spoke on the evening of 9 March on “How Many Maidans Does Ukraine Need to Become Different?” The video recording of all presentations will be soon available at CIUS Youtube. 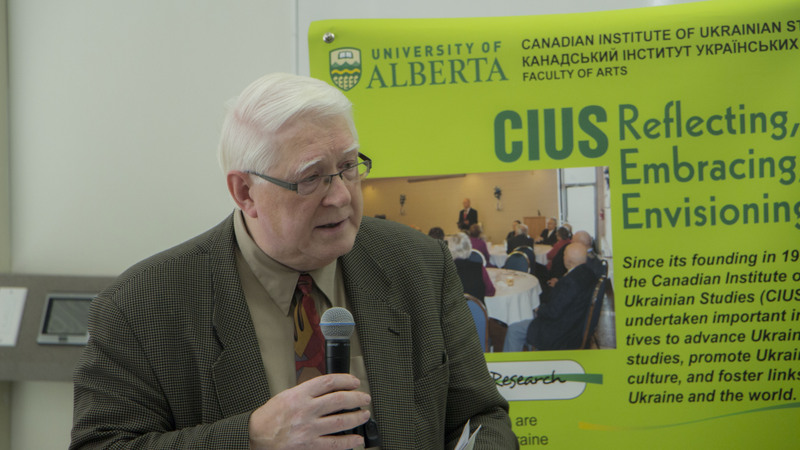 The symposium was supported by donations from the Alberta Society for the Advancement of Ukrainian Studies, the Alberta Ukrainian Commemorative Society, the Department of Modern Languages and Cultural Studies at the U of A, the League of Ukrainian Canadians, the Ukrainian Senior Citizens’ Club of Marko Boyeslav, the Ukrainian Women’s Association of Canada (Olha Basarab Edmonton branch), and Nick Sadiwnyk (Calgary).